Do you love making recipes that call for raw or undercooked eggs like Hollandaise, Caesar salad dressing, sunny-side up eggs, eggnog, or even raw cookie dough, but worry about the Salmonella risk? I learned about Davidson’s Safest Choice® Pasteurized Eggs a few years ago when they became a sponsor of our conference, the International Food Blogger Conference, which we hold annually. As the mother of a young daughter who loves things like poached eggs with runny yolks, Caesar salad, and licking the cake batter spoon (who doesn’t love that?! ), I was concerned about the risk of Salmonella. But with Davidson’s™ there are no worries as their eggs are pasteurized in an all-natural warm water bath that eliminates the risk of Salmonella without changing the flavor or nutrition. So now I can let my daughter lick the spoon without worry! 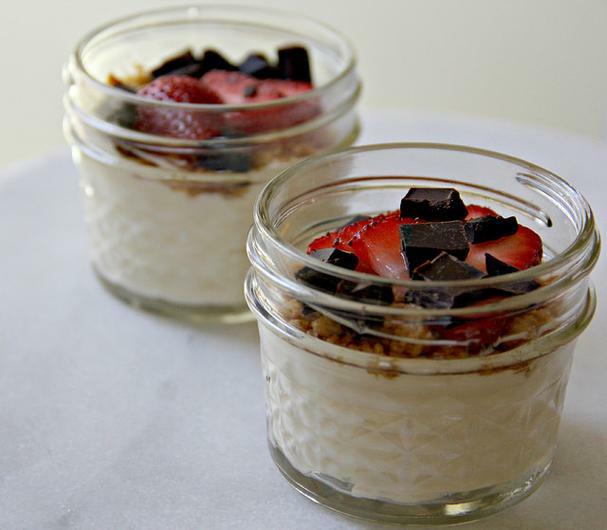 This cheesecake batter parfait recipe was developed by Davidson’s™ Chef Roddey. You can mix it up by adding layers of fruit, granola, or crumbled cookies (we love meringue!). Step 1: Mix graham cracker crumbs and butter together and bake at 325° for about 15-20 minutes, until lightly toasted. Cool and set aside. Step 1: In a large bowl, beat together cream cheese and sugar until smooth; about 3 - 5 minutes. Scrape the bowl every minute. Step 2: Whisk eggs, vanilla, and sour cream until smooth; about 30 seconds to a minute. Step 3: Slowly add the egg mixture to the creamed ingredients, scraping the bowl after each addition. Step 4: Pour into parfait cups and top with one tablespoon of the finished crumb topping. Editorial disclosure: Davidson’s is a sponsor of our 2016 conference, but Foodista was not directly paid for this post. As an actual user of their product, I wanted to share this recipe with our broader food loving community.